The 420 Archive is a new 501c3 Nonprofit organization with a national board. The mission is to collect & preserve the history, activism and culture surrounding the prohibition of cannabis in the United States. We are currently looking for volunteers to serve on Oral History Advisory Committee and to help collect oral histories. 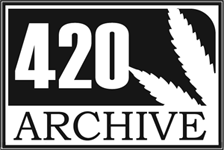 The 420 Archive is collecting a variety of oral histories from activists, policy makers, medical cannabis patents, and industry professionals. The organization itself is incorporated in California but board members are located throughout the U.S. If you would like to be part of this very unique archive and help fill gaps in the historical record on the U.S. cannabis history please contact Joe Hoover if you would like to advise or help in this project. info@420archive.org.